The Rotary Clubs of Menomonie have operated their Kids Against Hunger (KAH) project franchise since 2011. In 2015, the Chippewa Valley After Hours club joined the partnership to serve the hunger needs of western Wisconsin and internationally. Implement a hands-on project that carries a local and an international impact. Coordinate a community keystone project to engage area service-minded groups and gain more understanding of the Rotary organization and its mission. Create and sustain a strong, community volunteer humanitarian food-aid organization. Kids Against Hunger’s mission is to reduce the number of hungry children in the USA and to feed starving children throughout the world. 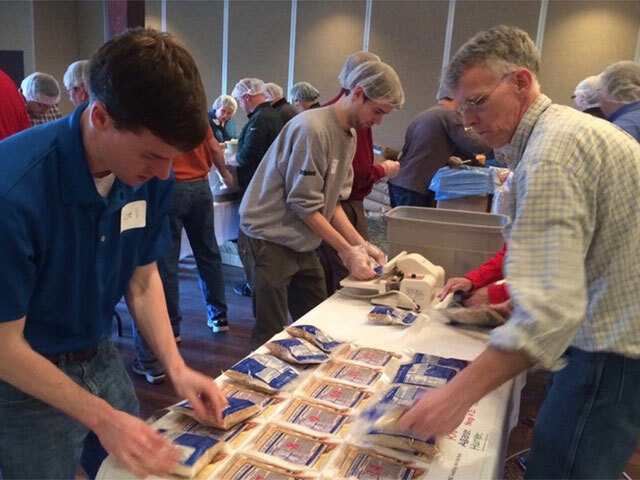 Community, service and corporate volunteers come together to assemble prepackaged meals that only require boiling water to prepare. These meals consist of a nutritionally complex, vitamin-fortified, well-balanced soy-rice mix. 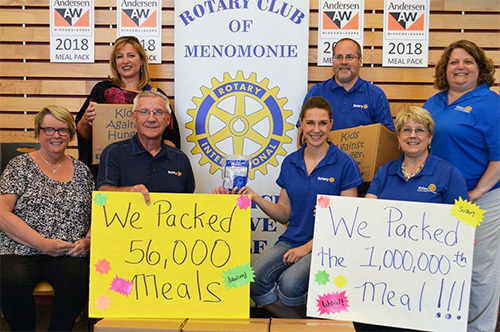 The Kids Against Hunger project, through the work and support of Rotary Clubs of Menomonie and the Chippewa Valley After Hours Rotary Club, in partnership with service-minded volunteers, has packed more than 700,000 meals in its efforts to eradicate hunger.